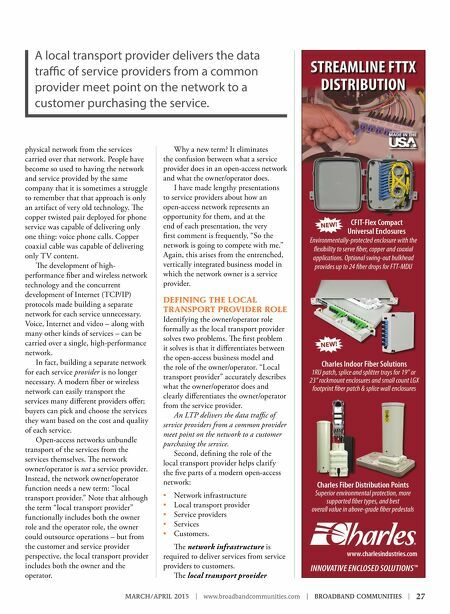 26 | BROADBAND COMMUNITIES | www.broadbandcommunities.com | MARCH/APRIL 2015 FTTH STRATEGIES The Role of the Local Transport Provider Focusing on network operators as local transport providers makes the open-access business model easier to understand – and highlights some of its advantages. By Andrew Cohill / WideOpen Networks O pen access has to be one of the most misunderstood concepts in the telecommunications industry. Open access is a business model just as triple-play is a business model. However, many explanations of open access are just plain wrong, and some border on being hysterical. Te most common misconception is that open access is synonymous with local government's directly competing with private sector providers at the retail services level. Nothing about the open-access business model requires government involvement or government ownership of the network. Some private networks operate on an open-access model. It is a very simple business model that has network neutrality built in: Buyers of services can pick and choose from a wide variety of service providers and services rather than being chained to the oferings of a single, de facto monopoly provider. No regulation is needed because the model creates a competitive marketplace inherently. A second misconception is that an open- access network is unfair because it competes with existing incumbent and competitive providers. Te fast-food equivalent of this argument would be that it is unfair for a Chipotle to come to a town that already has a Wendy's and a Burger King. Another frequent criticism is that open access "does not work" or "is unproven." With some open-access networks in the U.S. in business for eight years or more, and after many open-access successes in Europe, that myth is getting a bit old. Te open-access business model is straightforward: A network owner/operator provides local transport to several independent, private-sector service providers. Each provider ofers multiple competitively priced services to its own customers. Network revenue is derived from fees collected for transporting service provider trafc locally across the network from the service-provider entry point on the network to retail customers. I believe much of the confusion arises from the fact that, in most networks, the network owner, the network operator and the service provider have all been the same company. As an example, Comcast owns its network, operates its network and is the sole service provider on its network – this is called vertical integration. Open access has no such requirement. An open-access network unbundles the In most networks, the owner, operator and service provider are all the same company. Open access has no such requirement.